Beatles 50th-Anniversary 'White Album' Is Almost Ready . Beatles Radio: The Beatles, Solos, Covers, Birthdays, News The Fab 4 and More! 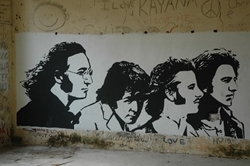 The beatles commemorated in India before recording "The White Album." A 50th-anniversary reissue of the 1968 White Album by The Beatles has been confirmed by Paul McCartney after months of speculation. The double album, which is actually eponymously titled although widely referred to for its plain white cover designed by artist Richard Hamilton, was made after about 30 rough demos had been recorded at lead guitarist George’s Harrison’s suburban home in Esher, near London, in May, 1968. Many of the songs were written during the band’s stay in India to study meditation earlier that year and the happy-go-lucky sessions went well. The quartet later worked them up in the London studio in a process that was far less harmonious. Most of the demos became finished works that made the record, although a few were held over to Abbey Road and a few ended up on solo albums.